A common convention used in video games (most often in FPS games) is to temporarily separate the player from another character or characters using unbreakable "safety glass." While separated, a dramatic event usually takes place (such as two characters fighting to the death) and the player is left a helpless spectator. This scenario is sometimes considered preferable to an in-game cutscene but the only advantage is an arguable increase in "immersion." If a game designer decides to employ the safety glass technique she has probably done so for two main reasons. One reason is that it is much easier to construct a non-interactive sequence. The sequence will always play out the same way without any variables. 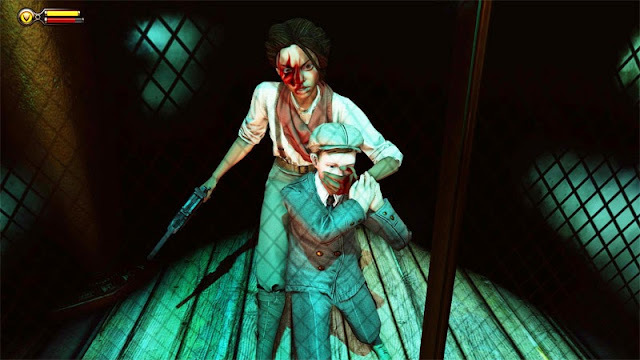 The other reason to use safety glass is that if the player has an unobstructed line of sight to another character (who is doing anything interesting) the player is likely to shoot them. And good players will shoot them in the face. This is a very practical approach to game design but it exposes problems on both the development side and the player's side. The problem for players is that they have been conditioned to shoot anything that moves unless their reticule turns green or their gun automatically lowers itself. This is a sad, sad standard. Luckily, lots of games have challenged this trend, but they are still the exception. The problem for developers is that ever increasing performance power demands higher and higher levels of spectacle. Instead of creating deeper experiences we are spending our time making more expensive explosions. We are making dumber, more expensive games. There are many reasons why we are in the state that we are in. The good news is that there are lots of new, creative games being developed (especially in the indie realm) that challenge the standards we've trapped ourselves with. So, game designers, the next time you find yourself roughing out a safety glass scenario, please stop and think. Why are you doing this? What could happen if you removed the safety glass? It's going to make things more difficult, that's for sure. But maybe something great will happen, for you and your players. You make a good point on the use of these events but you have to admit they are better than the same old Quicktime events that have been so overly used in this last generation. There are times where these techniques really help push the story forward and keep the player emotionally involved. Flashy graphics aside, the main reason a person plays a video game is for escapism, and a good story with plot development is what can keep the player hooked. If the player can’t find some sort of connection then what chance do you have at keeping the player involved in your game? One can also make the argument that not every game needs a good story to keep someone playing. Best examples of this would be the Super Mario franchise, fighting games, or sports games. Which is well and good but for the sake of the conversation we’ll focus on story driven games. But there is something to be said about the lack of interaction. Take Batman Arkham Asylum for example. I’m referring to (spoiler alert) Batman vs. Harley Quinn. Throughout the game Harley continues to egg on Batman. Then they have their big show down. You (Batman) finally get your revenge on Harley just to sit through a cut scene of them fighting and eventually her being locked in a cell. Sure it feels good to have extracted your revenge but it would have felt so much more rewarding to fight yourself. Don’t get me wrong, it’s an awesome series. As far as preventing the player from shooting another character when they shouldn’t is a simple enough fix that already exists in most games today. Take Battlefield for example; friendly fire is not tolerated. You keep shooting your teammates, even if by mistake, and you will fail the mission. Another example is from Halo. I got stuck in a section one time so I wanted to test the AI of the marines. You shoot a couple and they remind you that they’re on your side. Kill a few and the remaining marines will open fire and attack the player. You break the rules of the game and you lose. The best solution to this is to create multiple endings to the game with branching story lines, such as Fallout 3 and Mass Effect. The downside is this will create more work by the developer and content that may never be seen by the player. But that gives the player incentive to go back for another play through and possible achievement/trophy unlocking. Although the later has also become a crutch but that rant is for another day. In my opinion, the larger problem that the games industry faces is very much the same as the movie industry, being the stale repetitiveness of big name titles with very little difference in each release. Putting out sequel after sequel due to the simple fact that investing into a new IP is too high of a finical risk. Coming from my current job I have an understanding of that risk since I’m involved in product development. I’m not trying to get political so I will only brush by this quickly. Investing in a new IP is always a risk and even more so in our current economy. No one wants to waste time, resources, and money just to end up with a poor return. My name is John and I have posted as “Anonymous” since my website is currently under construction. You may reach me at j_hamill@ymail.com if you wish to continue this conversation. I’m always up for a good debate in the realm of video games.